1- Scanning now displays your upload speed. This makes it so the user can see the upload speed from their internet provider and confirm that images are transferring. 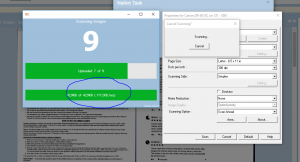 2- If while scanning a batch the internet connection drops scanning will continue but the upload speed will no longer be displayed and the processed pages will stop on the page where the disconnection happened. Also, an error message will be displayed giving an option to retry once the internet connection is re-established. 3- Once the internet connection is active and the retry option has been pressed yes, the pages will start to process again. Once that is complete refresh your screen and you will see all pages have been added and you can continue indexing.